The Campaign is holding a sponsored walk to raise money for Los Quinchos, which works with the children of la Chureca/ The walk is taking place in Saturday, July 2, starting in Blaenau Ffestiniog at 9.30. For the first time the walk will take place on two continents! 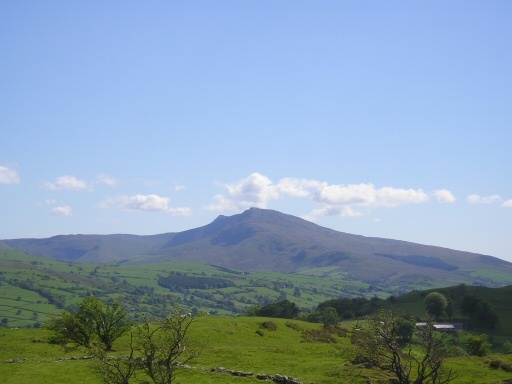 The Welsh crew will be walking through Cwm Prysor, and climbing up yr Arenig. 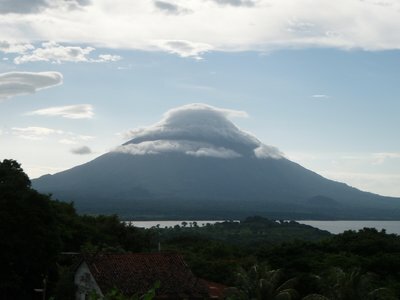 Meanwhile in Nicaragua, Campaign member David McKnight will be climbing Volcan Concepcion, on Isla de Ometepe. During the last three years the Campaign has raised nearly £20,000 for the work of Los Quinchos. We are raising £400 a month between now and the end of the year, to continue with our support. You can take part in the walk (see here for further details). Or you can donate on line here. Bydd yr Ymgyrch yn cynnal taith gerdded noddedig i godi arian i Los Quinchos, sy’n gweithio gyda plant la Chureca. Digwyddir y taith ar ddydd Sadwrn, Gorffennaf 2il, yn dechrau ym Mlaenau Ffestiniog am 9.30. Cynhelir y taith ar ddau cyfandir am y tro cyntaf! Bydd y criw yng Nghymru yn cerdded trwy Cwm Prysor, a dringo yr Arenig. Ar yr hyn pryd, bydd aelod o’r Ymgyrch, David McKnight, yn dringo llosgmynydd, Volcan Maderas, ar Isla de Ometepe. Yn ystod y 3 mlynedd diwethaf, mae’r Ymgyrch wedi codi bron a £20,000 ar gyfer gwaith los Quinchos. Rydym yn ceisio codi £400 y mis rhwng yn awr a diwedd y flwyddyn, i barhau gyda ein cefnogaeth. Mae’n bosibl i gymryd rhan yn y taith. Gweler y ffurflen nawdd am ragor o fanylion. Neu ydych chi’n gallu cyfrannu ar lein, fan hyn. The Campaign has been working for several years to create a link between Unison Cymru and the Nicaraguan public sector union UNE. In principle the Unison Cymru International Committee has decided to pursue twinning with UNE, and they are discussing the practical steps at the moment. The next step will come in June, when Domingo Perez, the General Secretary of UNE, visits Cardiff. The Sandinista government has transformed the conditions for unions in Nicaragua, and their ability to organise. The Campaign wrote about the conditions facing trade unions in Nicaragua after our last visit. See here for the article. Mae’r Ymgyrch wedi bod yn gweithio am sawl mlynedd i greu cyswllt rhwng Unison Cymru a’r undeb sector cyhoeddus, UNE. Mewn egwyddor mae Pwyllgor Rhyngwladol Unison Cymru wedi penderfynu i gyfeillio gyda UNE, ac mae’n trafod y camau ymarfeol ar hyn o bryd. Mae’r cam nesaf yn dod ym mis Mehefin, pan mae Domingo Perez, Ysgrifennydd Cyffredionol UNE yn ymweld a Caerdydd. Mae Domingo wedi anfon gwahoddiad personol i’r gyfarfod o Nicaragua, wedi ei ffilmio gan aelod yr Ymgyrch, David McKnight. Gweler ei wahoddiad. Mae’r llywodraeth Sandinistaidd wedi trawsffurfio’r amodau ar gyfer undebau yn Nicaragua, a’i gallu i drefnu. Ysgrifennodd yr Ymgyrch am y sefyllfa sy’n wynebu undebau cyhoeddus ar ol ein ymweliad yn 2009. Gweler yr erthygl llawn undeb. The Sao Paulo Forum, the left leaning gathering of Latin American countries, is now in its 21st year. Formed in 1990 at the initiative of Brazil’s Partido de Trabajadores, it has continued to meet, its latest coming together happening last week in Managua. It’s more of a talking shop than some of the other regional bodies which have since come to prominence. The ALBA – the Bolivarian Alliance for the Peoples of Our Americas – includes countries like Venezuela, Cuba, Bolivia, Ecuador and Nicaragua. In recent years it has become much more concrete, a process best described by academics such as Thomas Muhr, who writes convincingly about the gains for the bloc and individual countries (see TINA Go Home! ALBA and Re-theorizing Resistance to Global Capitalism). Another wide gathering of Latin American countries has also been making progress. UNASUR – the Union of South American Nations – was formally constituted in 2008, and its founding treaty became active this March. One of its most visible foreign policy achievements so far has been the wave of Latin American countries recognising Palestine since the new year. This followed negotiations between UNASUR and the League of Arab States in 2010. But with the Left and Centre Left governments in the region forming closer working ties, what’s the Right up to? Well, not too much, but what it is doing leaves an unpleasant taste. In December under the banner of “The Future of Freedom in a Global World”, a clique of Rightists got together in Santiago mainly to attack Venezuela, Bolivia and Nicaragua. Such well known defenders of democracy as ex-Presidents Alvaro Uribe of Colombia, Jorge Quiroga of Bolivia and Jose Maria Aznar of Spain were there, together with Mario Vargas Llosa, the Nobel literature winner from Peru, and an incomparably better writer than politician. Much more worrying than this collection of has beens and never wuzzes is a gathering which is meeting next week in Managua. The Antidote to 21st Century Socialism will be holding a forum hosted by the ‘civil society’ organisation the Movement for Nicaragua, a creation of the US National Endowment for Democracy, which also funds it. According to the Nicaragua Network, the self proclaimed purpose of the forum is to ‘unmask the supposed blessings of that political current (21st century socialism) which has Castroite origins”. Just in case you might want to know what the ‘antidote’ is, then there’s a clue in the headline speaker, Honduran Roberto Micheletti, who will appear by video link. He was one of the figures who organised the military coup there in June 2009, and was the de facto President. The recipients of this ‘antidote’ include another three journalists killed in Honduras over the past couple of months, joining the ten gunned down last year. Obviously the participants in the meeting will be keen to see their medicine spread to all the countries of Latin America and the Caribbean, after it was administered so effectively by military governments during the 70s and 80s. Whilst Nicaragua’ support for Libya and Syria has caused scathing comment from the Right, and more sighs from some of the Left, Nicaragua has made arguments why it has taken such a stand. The latest was last week, in a session of the UN Security Council. “Nicaraguan representative to the UN Maria Rubiales de Chamorro opposed the bombing of Libya, saying the UN Charter does not include any reference to an alleged right of humanitarian interference, but rather considers paramount respect for sovereignty and the principle of non intervention in the internal affairs of states. You don’t have to be a paid up member of the Gaddafi supporters club to be concerned about the bombing of Libya, and the way the targets of the war are being extended seemingly on a weekly basis. You also have to questions the motivations of the human rights groups criticising Nicaragua. Both UN Watch and the Lantos Foundations for Human Rights were set up by Washington insiders – the former by UN Ambassador Morris B Abram, the latter by US Congressman Tom Lantos. Whilst UN Watch and the Landos Foundation rejected Nicaragua, they backed a list of other countries, including Chile (who have imprisoned Mapuche land protesters under notorious anti terrorism laws dating from the fascist Pinochet) and Italy (who’s anti Roma policies are notorious across Europe, and who recently refused to rescue refugees crossing the Mediterranean, ironically fleeing Libya: 63 died on board). Perhaps a clue to their opposition to Nicaragua lies in the second part of their statement: they have consistently voted the wrong way on UN initiatives to promote and protect the human rights of others. This presumably refers to Nicaragua’s steadfast support for Palestine, and its refusal to back the US and NATO military interventions anytime, anyplace, anywhere. We can change the relationship between consumers and producers, and the relationship between prices, so that it a relation that allows us to live. Christian Aid Week, which began today, is focusing on Nicaraguan fair trade organisation SOPPEXCCA. The Campaign has been out today speaking with local churches about the work of SOPPEXCCA, and other Nicaraguan fair trade co-operatives, in improving the lives of coffee growers, their families and communities. Christian Aid have produced a short film/slide show, highlighting some of the acheivement of SOPPEXCCA in Jinotega, in Northern Nicaragua. SOPPEXCA themselves have produced a longer film, outlining the way fair trade is intergrated into their widr approach to development. Watch it here. On our visits to Nicaragua the Campaign has met with SOPPEXCA, and also visited fair trade coffee farms in the UCA Miraflor and the UCA San Ramon. 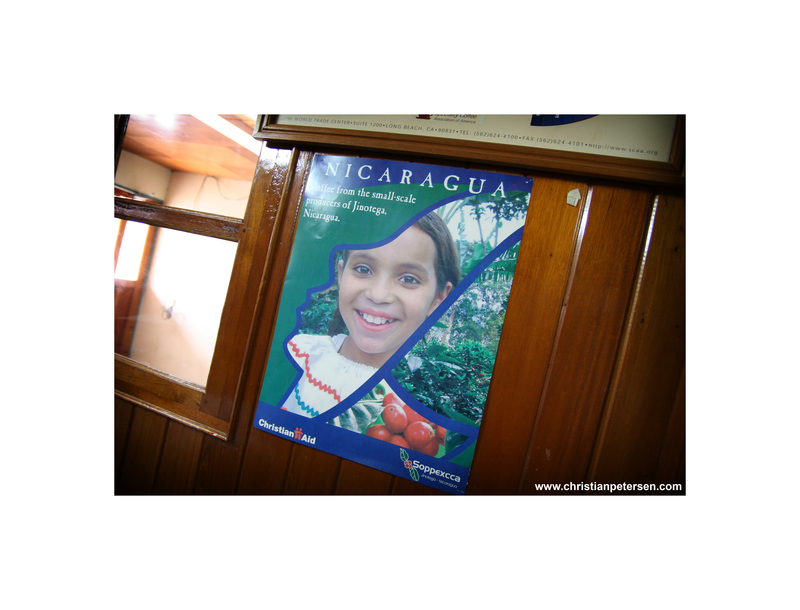 Both encourage eco-tourism, with a chance to stay with a family, learn more about fair trade, and sample the environmental wonders and traditional Nicaraguan cooking. The Welsh Campaign has a long history of promoting Nicaraguan coffee, from the almost undrinkable brew of the Revolutionary years, to the superb fair trade coffees of today, some of the best in the world. 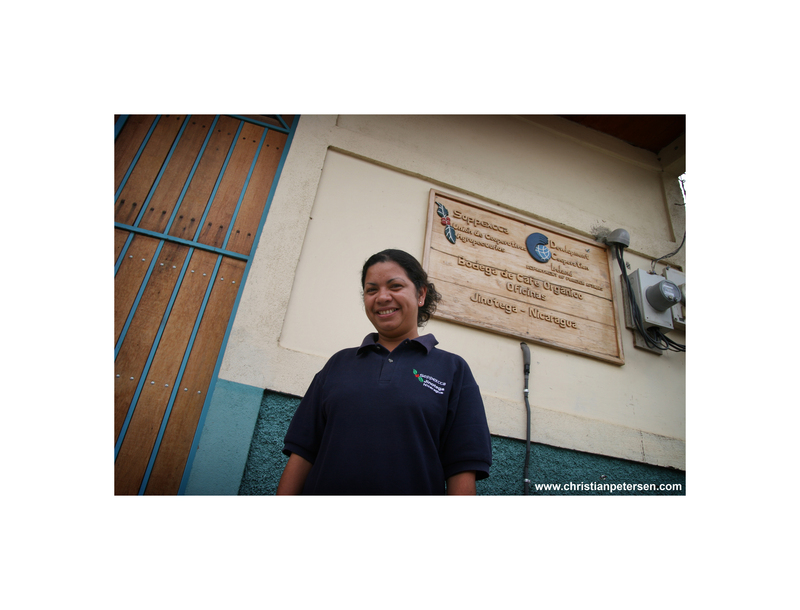 We have also hosted many Nicaraguan fair trade visitors, including Janixce Florian of SOPPEXCA in 2006. A video about the work of SOPPEXCCA is also available from our sister organisation, the Nicaragua Solidarity Campaign: Coffee – Take It Fairly. If you would like a speaker about fair trade, contact the Wales Nicaragua Solidarity Campaign.